I love using the Daily 5 in my class! If you want to see how I use it, check out my Daily 5 Series HERE. One thing I struggled with was accountability. I needed kids to know that I wanted to see their work-- not to gather it, collect it, and grade it each and every time causing more work for me-- but that I wanted to check in with them and make sure they were on the right track and not just playing on white boards during Word Work or chatting with their friends during Read to Self. This menu gives kids choice and allows me to check their work without lots of additional grading. When kids first receive this packet, they need to decide what Bingo they are going to make. Then, over the course of the next three weeks, they work on the activities and receive my signature in the box after they complete the work. You can find a fully editable version of this HERE for use in your own classroom. Each Word Work session equals one square. My sessions are only about 20 minutes, so it's not too long. If they do get done early, they can work on additional vocabulary words from the book we are reading as a group. For more about Word Work in my class, click HERE. To purchase some of the Word Work activities listed on the board, visit my TpT Store HERE. I love this because it gives kids tons of options and allows me to grade their work on a variety of skills and on any book. Yay! Remember, my kids had three weeks to complete this, so each week they had 2 Read to Self times. This menu was the result of 6 Read to Self times and I told them I would be grading accordingly-- each section needed their best work shown. These two pages are the only two I could grade from the packet. This menu gave me great insight into the teaching points I needed to work on with a student and some evidence for where they were growing. Each student was responsible for all three sections of a menu- appetizer, main course, and dessert. At the beginning of the year, I would instruct them to complete the "Appetizer" section on the first week, the "Main Course" section the next, and so on. Those explicit directions stopped as the year continued and kids built more independence. Toward the end of the year, it was not unusual to see some kids working on dessert first, other starting at the main course, and some jumping all around. I was a-ok with any of it, as long as it was their best work and all complete after three weeks. Have you ever tried a menu before? I LOVE it! 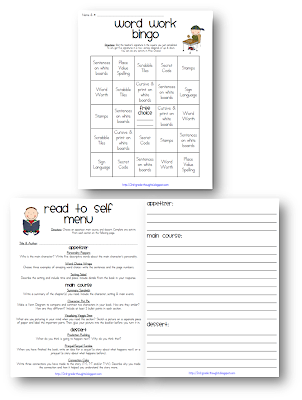 It's like Bingo, but so much more fun, especially if you love food as much as I do ;) This menu includes work on connections, summarizing, connections, characters, visualizing, and more! Would you like a copy of my these menus? 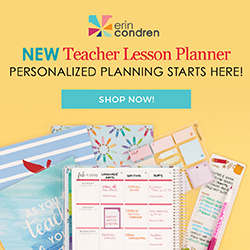 They are available in my TpT Store and there is a different menu for each month, spirling practice throughout the school year! Find them for 2nd, 3rd, and 4th grade HERE. I really struggled last year with finding a way to keep my 2nd graders accountable during Daily 5. ...I did take over mid-year, so that was part of the problem!. 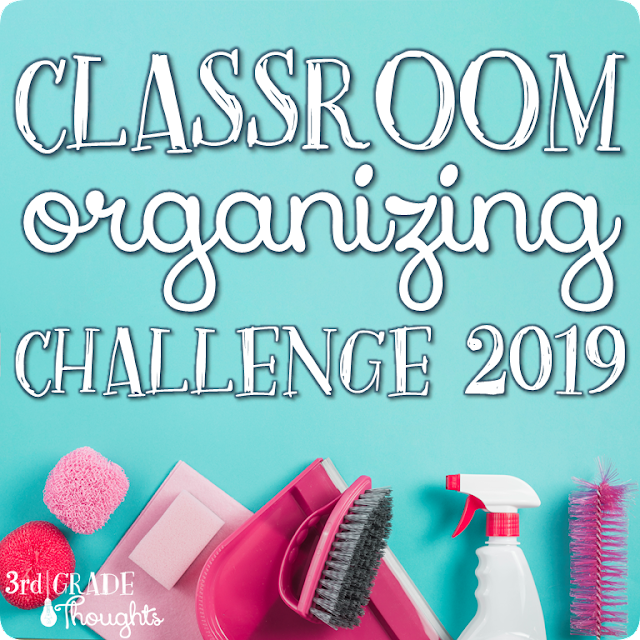 I LOVE these ideas and can't wait to incorporate them this new year. Thank you so much for sharing!! I love this! Thanks for sharing it. I haven't used Daily 5 yet but plan to this year since I will have a split classroom and I will need to be able to ensure my students are getting the most "bang for their buck" during literacy time. This is a great help, thanks! Thank you! 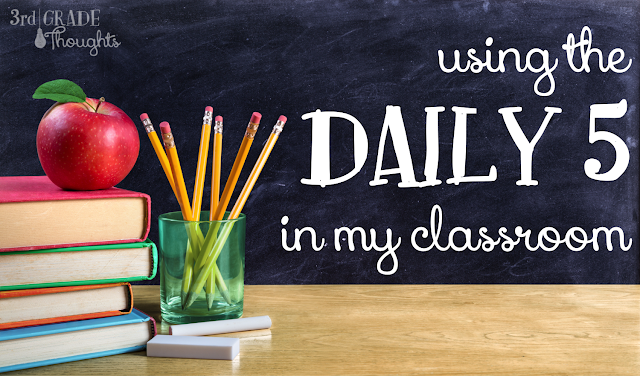 I have been thinking about how to keep my 3rd graders accountable this year during Daily 5. Just in time your post saved me. I really like the bingo idea! I do have one question though. How do you introduce all the activities. Do you show the kids one at a time and them once all of them have been introduced show them the bingo board? Yep, you got it :) They are pretty self-explanatory, so it doesn't take much, but when we are setting up Word Work and building our stamina, they practice the activities so when they get the Bingo board, they are ready to go. Wow Stephanie. This is amazing. How do you think of such WONDERFUL things? Thank you so much for creating this. So great! I love the Menu for Read to Self. This is a good way for them to practice skills and have accountability for that time. I am a follower of your page! You have such wonderful ideas to share. I just started blogging, and I would love if you would come check out my new blog. I just found you and can't wait to learn and share more with you. I thinks great! I struggled this past year when trying to keep my student accountable. I did create a Work on Words packet that went along with the work on words games for that week. I cant wait to try this out though! I am finally going to be able to start Daily 5 in my classroom next year and am so excited about the resources I have found on your blog. Thank you so much for sharing them. I can't wait to use them in my classroom. I love your Daily 5 series. I got them in google doc. Is there a way to get them in a different document, so that I could translate them to spanish. Thanks for sharing your experience and resources! 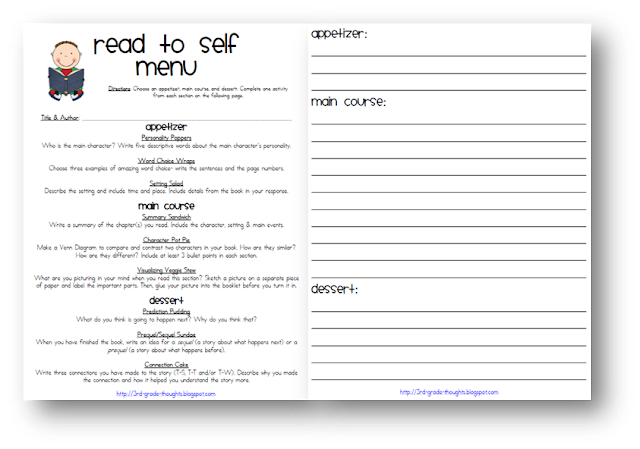 One question, with the Read-to-Self menu, did your students do this during that station or during the Work on Writing? In other words, when do they complete the menu activities? Thanks! Thanks for the great Freebies and information. I love the idea of the menu in and Bingo board in order to keep them on track. I think this would keep them from doing the same activity every time too! Thanks! Thanks for this freebie! 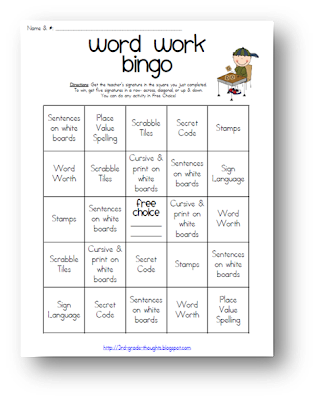 i love the word work bingo! great choices and cute format. I love these ideas! 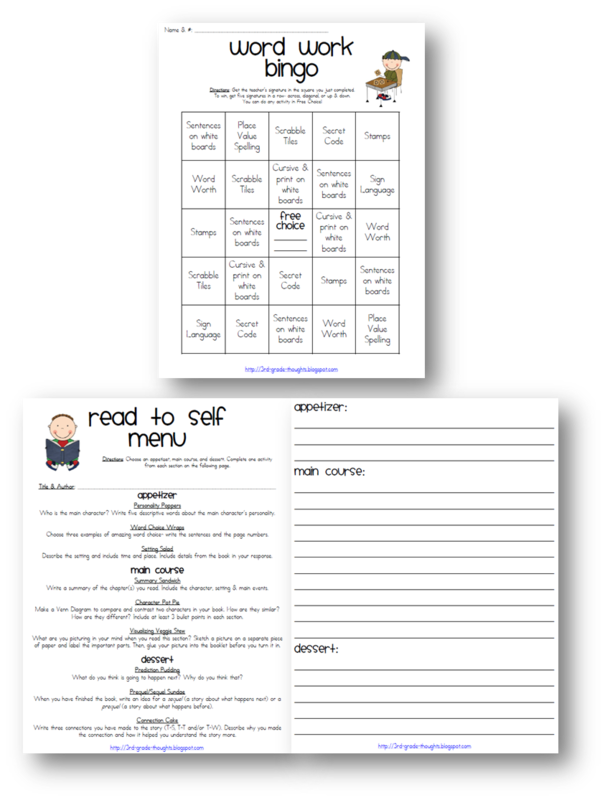 I am a little confused though with the Read to Self menu concept.. can you clarify a little more how it looks for kids over the 3 week period? 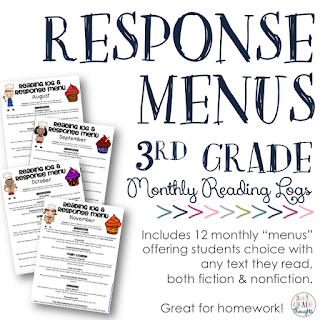 It seems like they are only writing/responding to what they read 3 times in the 21 days, but your comment "This menu was the result of 6 Read to Self times and I told them I would be grading accordingly" left me a little confused... Just exactly how often do your kids do Read to Self in a given week, and for how long each time? We have 15 minutes of all-class RTS each day, and then for the next hour the kids have anywhere from 20 to 40 minutes in a strategy group, followed by 20-40 more minutes of Daily 5 choice (depending on their strategy group)and I want them to have accountability for their D5 choice when they are working independently, so only having 3 pieces to write in a 3 week period doesn't seem like enough. Thanks for your feedback! Thank you so much for sharing your ideas! I greatly appreciate them! 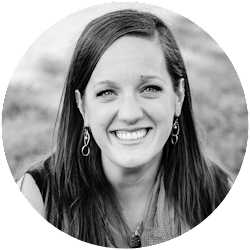 Stephanie - Your work is absolutely amazing! 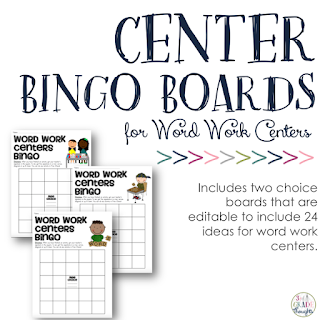 I was wondering if you've considered selling the Word Work Bingo on TpT with an editable option. I use many of the same options you do but a few different, yet your bingo card is SO cute! I wanted to let you know that I found this resource that you offer on someone's TPT site for sale for $2. They changed the clip art but it is the same text as the read to self menu. The same questions. I wanted to let you know. Here is the link to theirs. I love your menu idea! Especially since my classroom is themed around restaurant concepts. I was wondering if you have considered selling this on tpt in an editable version so that the activities on the bingo board and menu could be changed? I teach 2nd grade and some of the practice activities might be a bit too challenging. Thank you so much for sharing! I am reading everything you have on Daily 5 and your math rotations!